Students calling on the University to divest from fossil fuel companies have spent Wednesday blocking all doors of the Raymond Priestley Building, home to the University’ Chancellery and senior executives. The action is organised by Fossil Free Melbourne University (FFMU), who have been campaigning for divestment for the past three years. The University told us its focus during Wednesday has been on regaining access to the Raymond Priestley Building. Senior representatives from the University, including head of University Services Paul Duldig, and Elizabeth Capp, Director of Students and Equity, met with FFMU at 6pm on Wednesday. Update 11.15pm, Wed 20th: FFMU have announced on their Facebook page that they will end the blockade, after securing a meeting with Allan Tait, the University’s Chief Financial Officer, and Robert Johanson, a member of the University Council and chair of the University’s Investment Management Committee. A spokesperson for FFMU told us that they would be willing to leave the Raymond Priestley building’s doors if the University makes a firm commitment to divestment, even if it is over a period of five years. Earlier, Parkville Station witnessed officers from Victoria Police explaining to activists blocking doors possible Police action and possible charges they might face. Since then, the University has told FFMU that taken those charges off the table and are willing to negotiate – hence the 6pm meeting. As of publication, the activists remain in place. Reports we’ve received, and a lack of activity around the building, indicate that no University staff are working in the Raymond Priestley Building today. No word on whether they’re getting the day off or working at other locations on campus. This action is part of a wider “Flood the Campus” action at seven universities across the country. Other actions at Melbourne have included the setting up and occupation of a tent camp on Macfarland Court, and naked students yesterday on the roof of Old Arts. 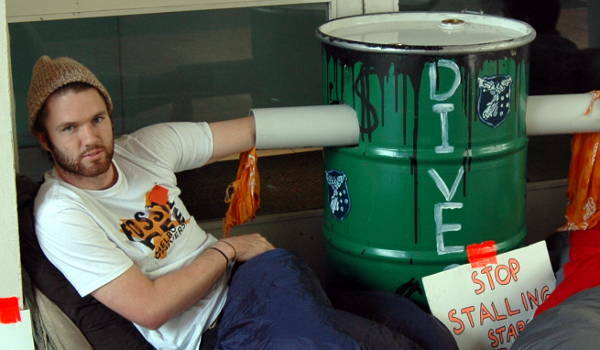 Check out next week’s Parkville Station for the full wrap of all the week’s divestment-related activity. Update, 2016-04-20 23.15: Added marked paragraph and adjusted wording to reflect the meeting between FFMU and the University.